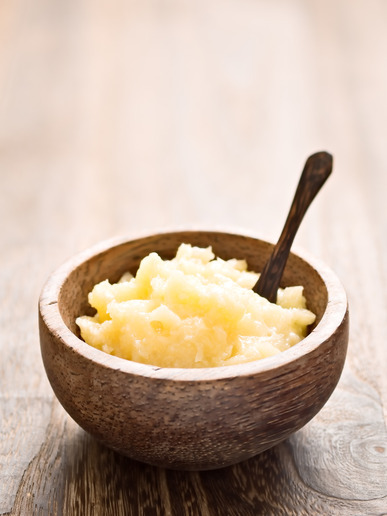 Ghee, an essential ingredient in much Indian cookery, is butter with the milk solids and water removed. Pure dairy fat! Just heat butter gently, and the components will separate. Then strain. That is the essential ghee recipe. Ghee is a type of clarified butter. The difference between ghee and regular clarified butter is that ghee is heated long enough for the milk solids to toast, so that they leave behind an incomparable rich, nutty flavor after they are strained out. Ghee (and all clarified butter) has a higher smoke point than butter. That means you can cook, saute and fry hotter in it without burning. When butter burns, it’s the milk solids, not the butterfat, that scorch. Though wonderfully flavored when toasted, they twang with a horrid bitterness when burnt. Ghee is stable at room temperature. You can keep it in a jar by the stove and scoop into it whenever you would customarily run to fridge for a pat of butter for the pan. No refrigeration necessary. We have kept ghee on the counter for months with no development of noticeable stale or off odors or flavors. Consider ghee’s land of origin: India. Ghee has been stored in the kitchens of those hot and humid climes for thousands of years, where it has been at the service of one of the most marvelous and savvy cuisines on earth. We use an old-fashioned “grease jar,” which every self-respecting, bacon-eating household used to keep handy for collecting bacon drippings, before people learned how horrible and disgusting a practice that was. Now everyone knows you should throw away that natural, nutritious substance and spend additional money to obtain the fabricated goo that the food industry kindly provides at a significant cost to you. Thank goodness modern technology has devised methods of wrenching the nearly digestible fats from all kinds of items that humans never had the option to eat before and bleaching and otherwise treating them to disguise their stench and unpalatability. And thank goodness that modern marketing has managed to convince people that good health is impossible without them! Gee, just think what the human race was missing all those hundreds of thousands of years before we figured out how to choke down canola oil, soybean oil and cottonseed oil. The flavor of ghee is similar to butter, but the profile is somewhat different because of the absence of milk solids. The “milky” flavors are gone. That, and a slightly crystalline texture, makes it less suited than butter for buttering bread tableside. That is, butter, with all its additional components, is creamier than just the butterfat all by itself. Besides using it in Indian recipes that call for it specifically, I love it for basic cooked greens or any sauteed vegetables. Try it with green beans, mushroom and diced red bell peppers, for instance. Mmmm, it’s warm and soothing — it just feels nourishing. Add a little garlic and you’re over the top. In a good way. Premium butter is a great choice here. No matter what kind of butter you start out with, the fat is all that will be left when you’re done. You might as well buy something that contains more of what you’ll be keeping in the first place. That is, regular butter has more of what you’re getting rid of by making ghee. Really cheap butter might have even more. The dairy solids will stay behind in the strainer and the sauce pot. They’ll look like soft, toasted breadcrumbs. Eat them warm. They are unspeakably delicious! Those who eat crackers or toast can spread them on that. Others can nibble them off a spoon. Tasting the solids is instructive. It will show you, beyond what any words can convey, what the components of butter’s flavor are. There’s a fresh-milk flavor in them. It’s a great demonstration of what does and doesn’t taste like this or that. The butter gets very, very, very hot. Several times hotter boiling water. Always use extreme caution working with hot fats. European butter, Irish butter, or any such extra-high-fat specialty butter is an excellent choice for making ghee. Because ghee is essentially butter with everything but the butterfat removed, the more butterfat you start out with, the more ghee you wind up with from your original purchase. *Cast iron enameled with a light-colored enamel on the inside is the very best material for this task. The cast iron will allow you to heat the butter gently. The light interior will allow you to monitor the progress of the toasting milk solids so you don’t accidentally burn them. Nonenameled iron is excellent for the task, except that it is difficult to see what’s going on. With a lightweight pot, you run the risk of scorching the ghee. A flame tamer — a disk that helps buffer the heat of the stove — is essential until you get a heavier pot. Heat butter gently until the solids precipitate. Let the solids toast. Strain. Place the butter in a small, sturdy saucepan over the lowest heat. First, the butter will melt. The milk solids will gradually rise to the top. No need to skim as you go. Some recipes instruct you to skim. This is more work, and wastes a lot of butter. It’s just not necessary. The water in the butter will begin to boil out. Water boils; oil/fat doesn’t. Eventually, all bubbling will cease. That means the water has left. Keep in mind that water only gets to boiling temperature. This is by definition, right? At boiling temperature, it evaporates and rises into the air, and that’s what “boiling” is. When it’s hotter than boiling, it’s not water anymore; it’s steam. Oil, on the other hand, can get hundreds of degrees hotter. So, if you’re not certain, it’s better to err on the early side, at least while you’re still getting familiar with this process and product. If the milk solids scorch, the entire batch will be ruined.The worst that can happen if you strain it a little too early is that you’ll have delicious, nutritious clarified butter that’s not quite as toasty-tasting as ghee. And for all I know, you might prefer it that way. Slowly and carefully pour the contents of the saucepan through a mesh strainer lined with a coffee filter or paper towel. Remember that at this stage it’s super hot, much hotter than boiling water. Pour it into something that is heat resistant, like a Pyrex or stainless steel bowl. Let cool. The resulting ghee will be a pale straw gold color. If you want to remove any bits of foam or solids that got into the ghee during straining, wait until it’s cooled. Then you can easily scrape them out.